The beach in front of the Makena Beach & Golf Resort is the closest departure point to get to Molokini Crater. Only 1 boat, the Kai Kanani, is allowed to have beach entry on Maluaka Beach in Makena. The Kihei Boat Ramp is the second closest departure point to Molokini. Very few vessels leave from here, and of them we really like the Redline Rafting. The most popular destination to leave from is Maalaea Harbor because it holds many boats and because it's close to both south Maui and west Maui areas. The Calypso has a large, stable catamaran that runs really fun trips. 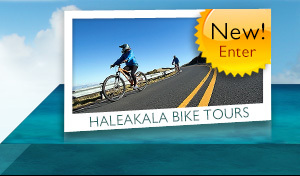 The furthest departure point from Molokini is Lahaina Harbor. Most people staying in west Maui (Lahaina, Kaanapali, Kapalua, Napili) choose to make the 20-30 minute drive to Maalaea Harbor. Trilogy has a great reputation for fun Molokini snorkel trips. The inner portion of the crater is considered Subzone A, which means their are special restrictions of potentially harmful activities. Some examples include feeding the fish, fishing for or capturing fish, alter sand or coral in any way, to moor or anchor where not permitted. This keeps the inner area protected from excessive harm. You'll see that the ocean life is thriving due to the marine conservation efforts. Subzone B allows for some permitted fishing. 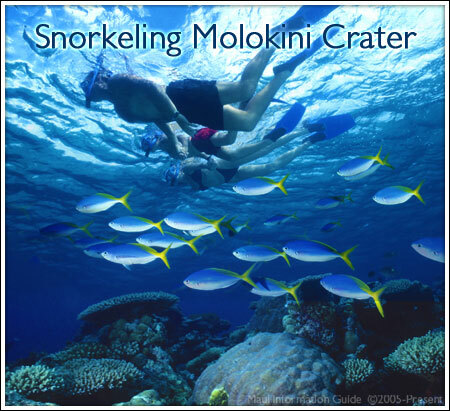 This zone is especially popular for snorkeling, because the protective walls of the crater usually offer a much higher visibility in the water. You can often see as far as 100 feet in front of you. The more popular spots are Middle Reef, Tako Flats, Shark Condos and En'e Nu'e. 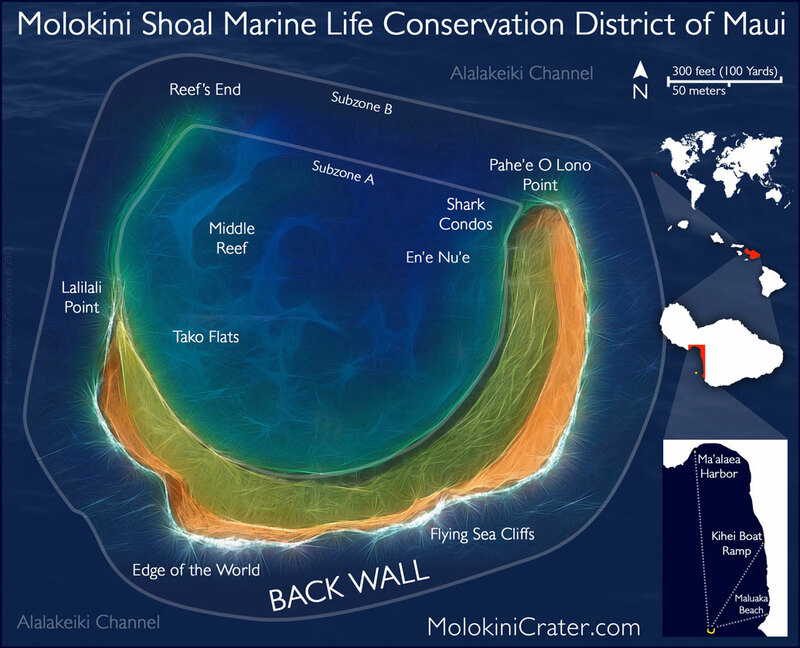 From the inner wall of Molokini, the crater floor slopes down ward, which allows for opportunities to snorkel as close as you want to the reef. 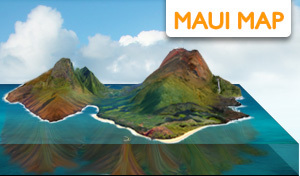 See our other Maui snorkeling Maps. Snuba Diving is a great way to enjoy the best parts of scuba diving without all the training and restrictive gear. When snuba diving, you use the same equipment as scuba, only your tank is floating at the surface on a raft, you're connected via a long hose, and you don't need the BCD wrapped around you. Diving closer to the reef is much easier than snorkeling, and you can stay down. Fish sometimes shy away from snorkelers because of their erratic up and down swimming. With snuba or scuba, your relaxed state seems to put them more at ease. Though at Molokini, you'll be surrounded by fish regardless of how you get in the water. No experience or certification is required and it's a ton of fun! 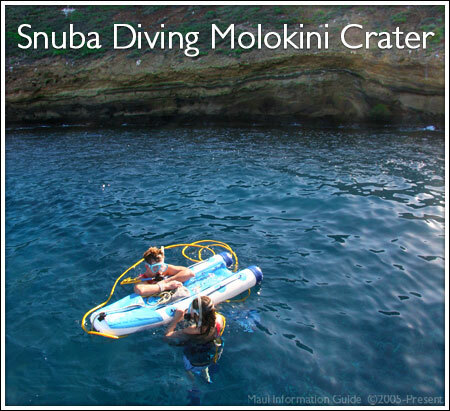 Learn more about Maui Snuba Diving. 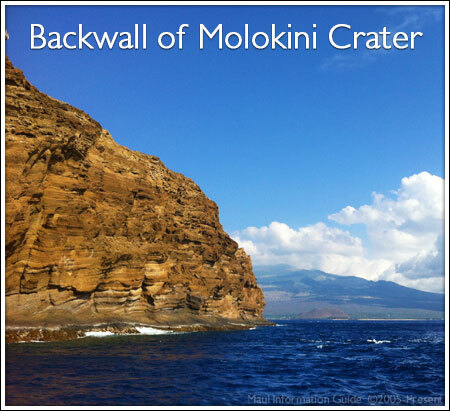 The backwall of Molokini Crater is world-famous for its drift-wall diving. It's incredibly deep (the wall drops straight down to over 350 feet deep.) It's more for advanced divers because buoyancy control, good air consumption, and experience are important for safety. This is not a good place to snorkel. Inside of Molokini Crater is also great for diving. There are less currents, though near the edges it can be strong. When scuba diving, you can go deeper and past the snorkeling areas and get to deeper, magnificent reefs. Make sure you're certified and are current on your diving knowledge. See our other Maui Scuba Maps.